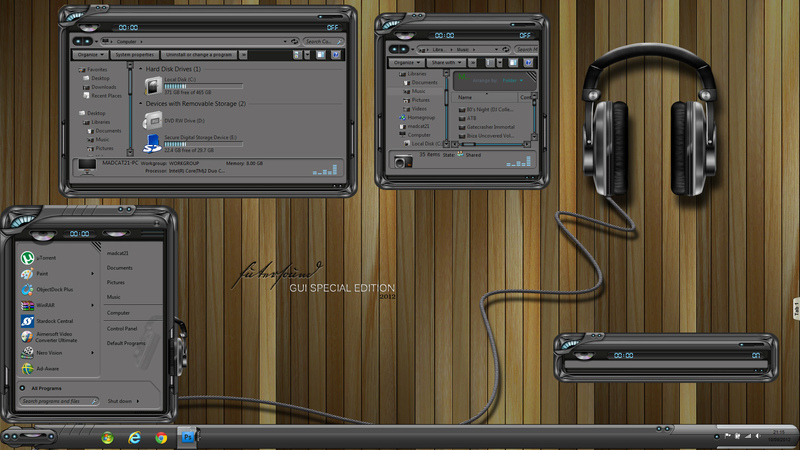 here is my new win 7 windowblind future sound 3 don for the GUI championships 2012. I like this. Send me stuff for DX. Hey Madcat 21!! You never cease to amaze me with your skinning abilities. I love this skin dude!! It is awesome and should be a master skin. I know that means we'd have to pay for it but it would be well worth it. Your talents are unsurpassed. Is there going to be a wallpaper and other things to go with this? Love it Buddy!! Absolutely fantastic!!! Gorgeous and a pleasure to use!!! fanx mate,,ill send you what i have asap..
Hey Madcat 21!! You never cease to amaze me with your skinning abilities. I love this skin dude!! It is awesome and should be a master skin. I know that means we'd have to pay for it but it would be well worth it. Your talents are unsurpassed. Is there going to be a wallpaper and other things to go with this? Love it Buddy!! GREAT JOB! anything related to music, i love! thanks! great skin! I dl'd this at the guic page and it's just awesome! Love how it looks with that wall too. Man, that's a mighty fine looking skin! And the wood really gives it a touch of class. Hey guys! can anybody help me to run this thing... i dont know how.. Same here beautifulstaci. The files were extracted but don't know what file installs the skin. The files are TGA or BMP. you need windowblinds to use this blind and you should download this with google chrome or firefox. I love this theme, thank you.